Hey Readers! It was such a beautiful day today! So sunny and breezy, just the way I like it! Spring is definitely my favorite season. 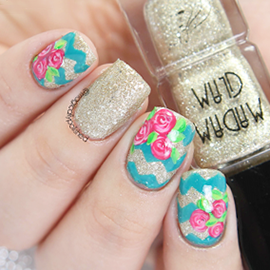 And speaking of "Spring", I have for you some spring like nails today. Just recently I was contacted by Sammy Dress to do some nail art reviews for them. They sell variety of things and now are branching to nail art. So of-course I said yes and here I have some real dried florals. I've never used any sort of dried florals before and was a little scared to do so, but I thought way not try it out. It's also now becoming very popular to use for this season, and was very pleased with the results. Before I get to the design, below are the florals I received. Intentionally, I did not chose these. I assumed I was going to receive the one pictured on their site; but I can honestly say these were so much cuter. In the package you'll receive 12 dried flowers ranging in different colors. For the base I used, two coats of Floss Gloss Wet for the forefinger and pinky and two coats of Biscuits. Once that was set, I added two dots on top of Floss Gloss Wet. I then added dots on top of Biscuits, for where I will place the dried florals. It's very important to let the polish dry first, for the dried florals to be placed. 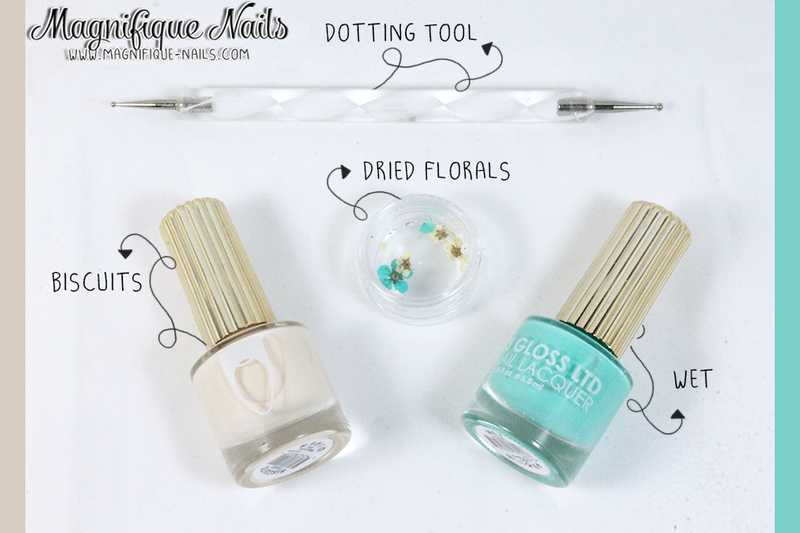 I applied a small amount of top coat and with a tweezer I added the florals, carefully. A petal will defiantly brake, if not handled with care.